Establishing an observing network of mobile and fixed platforms and tools across the Arctic to document and understand the Arctic's rapid biological, physical, chemical, and social changes. Current Arctic observations are sparse and inadequate for enabling discovery or simulation of the processes underlying Arctic system change or to assess their environmental and economic impacts on the broader Earth system. Arctic change will fundamentally alter climate, weather and ecosystems globally in ways that we do not yet understand but that will have profound impacts on the world's economy and security. Rapid loss of Arctic sea ice and other changes will also bring new access to the Arctic's natural resources such as fossil fuels, minerals, and new fisheries, and this new access is already attracting international attention from industry and nations seeking new resources. 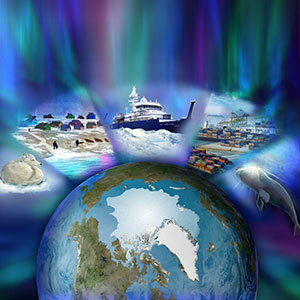 More information about Navigating the New Arctic.